The Horror Honeys: Honey Buzz ~ Annabelle's newest TV spot! Honey Buzz ~ Annabelle's newest TV spot! Seriously? Time for a divorce. 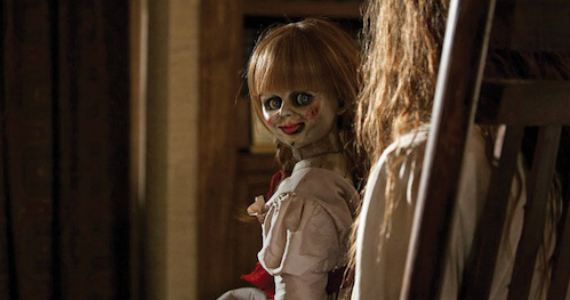 The most highly anticipated October movie that everyone (except us, I think) is crapping themselves about is James Wan's newest doll feature - Annabelle. The spin off from the annoyingly highly grossing supernatural film all about how awful witches are, The Conjuring, features one of the ugliest dolls I've seen in a long time. It's a theory of mine that James Wan spends hours alone in a windowless room sitting on a wooden floor rocking back and forth and giggling to himself while he paints all of the dolls that appear in his films by hand. WELL - for those of you utterly terrified by this horrendous little incarnation of evil, a new TV spot has been released guaranteed to chill you to the...well...maybe it'll just make you wary of husbands bearing ugly gifts. Annabelle hits theatres on October 3rd.